DocuSign lets your constituents and employees manage agreements and approvals digitally. Save time and money and avoid the errors of printing and faxing, so you can stay secure and compliant, retaining your legacy IT systems. DocuSign has more than 300,000 customers and 200 million users—including hundreds of local, state, federal, and international government customers. With DocuSign, you can reduce time-to-completion and delight your constituents without the hassle of overhauling your IT systems. DocuSign works with your existing documents, forms, and tools, allowing approvals and agreements to be completed digitally. DocuSign helps you dedicate more time toward serving constituents and less time chasing paper. 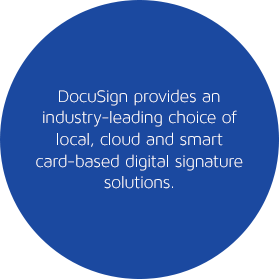 DocuSign helps you eliminate the tedious, time-consuming tasks of printing, faxing, mailing, and scanning. Going digital saves time, reduces errors, and maintains the security of sensitive information. Streamlined workflows increase internal efficiency, offering both constituents and employees a digital user experience they expect—reviewing and signing documents electronically at their convenience, from the device of their choice. DocuSign is the global solution trusted by governments around the world. We have more than 200 million users in 188 countries, and support signing in 43 languages. DocuSign meets regulatory requirements around the world, including the European Union (EU), Asia, Latin America, Brazil, and more. Want to see how DocuSign works? Get your free 30-day trial. Have questions about how your organization can use DocuSign?